Since the lease on our apartment is running out soon, Tammy and I have been looking at houses over the past few months and it’s becoming like a never-ending episode of House Hunters. Since Feb. 27th we have looked at FOURTEEN houses. Seriously. And those are just the ones where I started keeping track. In all honesty, I think the number is at least double what I’ve written down. I know there was a two-weekend stretch where we looked at 13 houses, five one Saturday and eight the next. 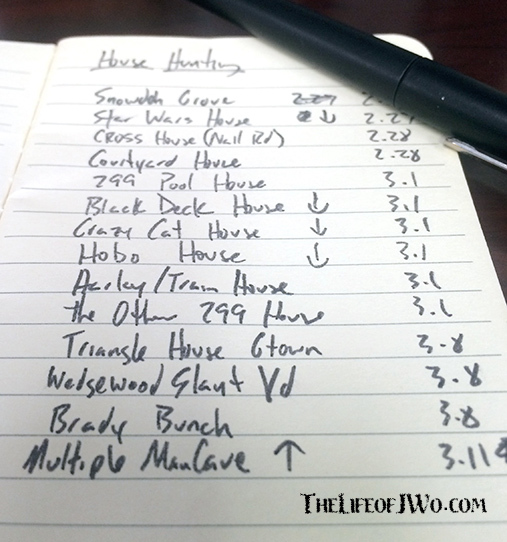 I started nicknaming the houses so I could recall them, but there was getting to be so many that I needed to start writing them down. Sometimes the nicknames are about the house itself, as in the Black Deck House or the Courtyard House. But there are times when nothing about the house stands out. Those get nicknamed differently. Star Wars House: Had a miniature Darth Vader in one of the kid rooms and there were multiple light sabers throughout the house and yard. Cross House: One bedroom had about 30 crosses hanging on a wall. Crazy Cat House: The cat followed us around the house and would slightly raise up on its hind legs before running into another room. Hobo House: The house was empty except for the pillows and sheets laying in the living room floor. Harley/Train House: The owner had a bunch of Harley Davidson stuff and appeared to work for a train company. Brady Bunch House: The inside was nice, but the outside looked like it belonged in same neighborhood as Marsha, Cindy, Peter and the rest of the gang. We’ve found a lot of what we liked in several houses, but have yet to find EVERYTHING we want in one house. To date, Tammy has fallen in love with 3 houses, one of which has already been sold. While I really liked her houses, I didn’t love them like she did. The same can be said about her feelings toward the one house I fell in love with. Neither of us wants the other person to be unhappy so we aren’t pushing our individual “favorite” house. If one of us doesn’t like something about the house, we discuss it and move on. We currently are leaning toward signing a 3-month lease for our apartment and will continue to look for the house that makes both of us feel at home. Gallery | This entry was posted in Daily Life and tagged daily life, home, house hunters, humor, life, Postaweek2014, shopping, Tammy. Bookmark the permalink. Good luck on the house hunting! I thought looking for a house would be a lot like looking for an apartment, but it’s a whole different ballgame. When you’re putting down that much cash, you deserve to find a place that both of you love. I’ve seen 8 houses, and I already feel exhausted. I went into a place where the guy had dirty underwear on the top of his laundry basket in the bathroom. Gross. Good luck to you and T! We’re looking for this place to be the place we stay for a while, so we want it to be something that makes both of us happy. Okay, I’d stay out of the “cross house” if I were you. Just saying. You know there has to be a reason to have 30 crosses in one room. Might be fun to bring your recorder to the next open house there.